REVISED AND UPDATED FOR 2019! 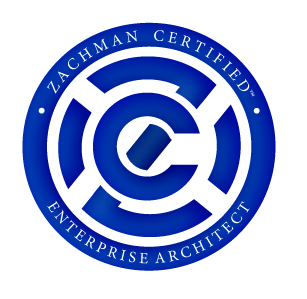 Zachman Certified Enterprise Architect and FEAC Certified Enterprise Architect (CEA) are industry-recognized credentials. You have worked hard to earn this prestigious milestone and need to adhere to FEAC’s and Zachman International requirements for maintaining the certification by participating in the Credential Renewal Program (CRP) to retain this professional achievement. The following guidance directs the standard for Enterprise Architecture Development Units (EADUs) as part of maintaining the Zachman® and FEAC® enterprise architecture certifications. This recertification guidance leverages the broad sources of education and professional development opportunities you engage in as a professional as the source of maintaining your certifications. (1) Continuing Education-Focused on continuing professional development as a part of maintaining competency as an enterprise architect. Continuing education is designed to enhance your technical architecture knowledge; critical and analytical skills; and interpersonal skills. (2) Developing the Profession-Activities that focus on your contributions to the profession through the practice of EA and working with others on enterprise architecture use. Research has shown practitioners require a broad foundation of continuing education to maintain their relevance in the workplace. Enterprise architecture practitioners need technical architecture skills; analysis and critical reasoning; and strong interpersonal and facilitation skills. The Education Category is divided into three competency areas: (a) Architecture, (b) Analytical Thinking, and (c) Interpersonal Skills. The following table provides additional detail on the EADU categories and amplifying guidance. Please note that you may be requested to provide documentation if your request for EADU’s is selected for audit. Accepted documentation normally consists of a copy of completion certificates, letter of attendance, registration forms, etc. This documentation is NOT retained beyond any specific audit. Architecture: Competencies building around the technical skills and knowledge as a part of developing accurate and robust architecture elements in support of enterprise outcomes. This competency is specifically focused on (but not limited to) the hard skills built around the use of architecture frameworks; ontologies; meta-models; modeling notations and tools. This includes education in areas such as Model-Based System Engineering; Architecture frameworks; Modeling notations (e.g. UML, SysML, BPMN, etc. ); Reference architecture and models; and architecture techniques. Analytical Thinking: Competencies building around methodical approaches to thinking that allow you to break down complex problems into single and manageable components. This includes the development of skills and knowledge of critical thinking; research; communication and creativity. Education competencies in this area include courses that improve skills in these areas. This includes education in areas such as System Engineering; Strategic planning and analysis; risk management; optimization and analysis techniques. Interpersonal Skills: Competencies building around softs skills and emotional intelligence related to communication and interaction with others. This includes the development of skills around conflict resolution; negotiation; facilitation; relationship building; team dynamics; emotional intelligence and communication skill-building courses. Sharing your knowledge and skills with others is an essential part of developing the enterprise architecture practice. Activities that are eligible for submission in this category include working as a practitioner, creating content for others (e.g. Articles, Presentations, etc. ); giving a presentation or speaking related to enterprise architecture; sharing knowledge (e.g. serving as a moderator, SME or mentor) or volunteering your EA knowledge and skills for another organization without compensation. The FEAC™ Institute and Zachman International® triennial process for certification credential renewal is similar to other professional organizations. Your EADU cycle begins on the month of graduation and you should begin filing and recording EA Development Units (EADUs) for the three-year cycle. For example, if you graduated, as a CEA, ACEA or ZCEA in April of 2013 your certification is active until April 2016. During this cycle, you should be recording EADUs using the online submission form on your profile. In April 2016 you submit a request to renew your certification along with the administrative processing fee of $99 US. Under the menu My Account/My Profile then the EADU Submissions Form tab, download the EADU Excel Spreadsheet. You can keep this form resident while filling out your EADUs for the current period. When you have completed this form, please submit it back to us using the link on the same page. We will make notes on the page whether these Units were approved or disapproved. If you have submitted your 60 hours, and you are actually applying for CEA renewal and are looking to pay your $99 renewal fee, go to the My Account/Certification Renewal menu, click the link and you will be prompted to pay your renewal fee. Your request will be verified and processed by an administrator. EADUs earned in excess of a single triennial cycle may be applied to the next cycle, but will still incur additional processing for review, acceptance, and auditing of your professional development efforts and a separate submission must be completed for evaluation. If your certification lapses before you have submitted your CRP worksheet and renewal fee your certification will show as suspended. This suspended period will remain in effect for 12 months during which time you may not refer to yourself as being FEAC certified until you have completed the necessary EADUs and/or complete the CRP process. Should you not complete the necessary EADUs or do not complete and submit the CRP worksheet your certification will show as expired. You may not refer to yourself as a FEAC certified enterprise architect or use the CEA/ACEA/ZCEA designation. To attain the recertification, you will be required to contact the FEAC Institute (https://www.feacinstitute.org/contact) and complete a recertification exam along with submitting re-testing fees.